The NHTSA reports that students are 70 times more likely to arrive at school safely if they take the bus versus a car. Although school buses are statistically the safest way for children to get to school, school bus accidents are still an unfortunate reality. According to the National Highway Traffic Safety Administration (NHTSA), between four and six children are killed in school bus accidents every year, and another 17,000 children are treated in emergency rooms for injuries sustained in school bus accidents. Fortunately, there are steps parents can take to ensure their children arrive at school safely. Drivers can also do their part to reduce the number of school bus accidents. The NHTSA reports that students are 70 times more likely to arrive at school safely if they take the bus versus a car. The reality is that driving in a regular vehicle significantly increases the risk of being involved in a serious car accident. Buses are big vehicles that sit high off the road. They also move slowly compared to other vehicles, and they are definitely easy to spot given their bright yellow color. All of these factors make buses a much safer form of transportation for kids. The NHTSA gives several tips for making sure kids stay as safe as possible anytime they are around a school bus. Get to the Bus Stop Early – It’s easy to overlook safety when you’re in a rush. People tend to act more carelessly when they’re running late. This is why it’s important to arrive at the bus stop at least five minutes early. Never Leave a Child at the Bus Stop Alone – Whenever possible, an adult should stay with children at the bus stop. Many parents work, so it’s not always possible for a parent to be there at all times. However, a lot of neighborhood parents work together to share the responsibility of waiting. Ask your neighbors if you can take turns waiting with the children at the bus stop. An alternative is to see if a retired neighbor in your area wouldn’t mind waiting with the children until they board the bus. Stay Six Feet Away from the Curb – It’s important to maintain a safe distance from the road. If your child is too young to understand distance, tell them to stay at least “three giant steps” back from the curb. Enter and Exit Safely – Teach children to wait for the bus to come to a complete stop before entering or exiting the bus. Children should also wait for the bus driver to motion for them to enter the street. Never Walk Behind the Bus – Children should never walk behind the bus, as the bus driver won’t be able to see them. If a child drops an item, such as a book or jacket, in the street, he or she should continue toward the bus and tell the bus driver about the item. This is much safer than a child stopping in the street to retrieve a dropped item. 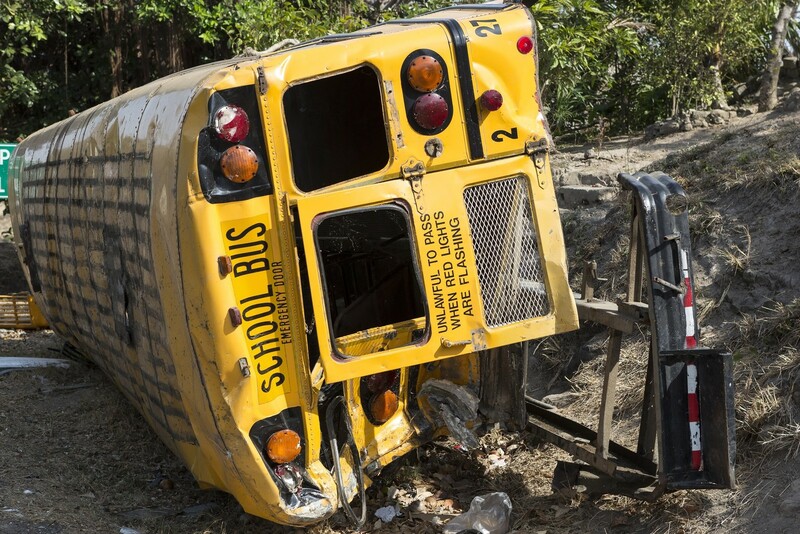 The majority of school bus accidents are actually caused by other drivers. According to Stanford Children’s Health, studies show that over 40 percent of school bus injuries happen because other drivers act negligently. Additionally, about 24 percent of school bus accidents occur when a child is entering or exiting a school bus. Many of these accidents happen because a motorist approaching the bus is either driving too fast or isn’t paying attention to the road says Rand Spear an experienced Philadelphia personal injury lawyer. Unfortunately, some motorists don’t fully understand the rules of the road when it comes to school buses. In other cases, drivers are in a hurry to get to their destination and become frustrated when they get “stuck” behind a slow-moving school bus. Drivers can do their part to reduce the number of school bus accidents by driving responsibly around school buses. Slow Down – Excessive speed is a leading cause of all car accidents, including school bus accidents. The majority of school bus fatalities occur between three and four in the afternoon when kids are getting out of school. Drivers should always obey school zone speed limits, and they should take it slow any time they are driving during school bus pick-up and drop-off times. Pay Attention – Distracted driving is an issue that continues to get worse. When drivers are looking down at an email or trying to reply to a text, their full attention isn’t on the road. It’s important to stay alert behind the wheel, especially if you’re driving through a school zone. Stop for Flashing Lights – Drivers are required to stop when a school bus puts on its flashing yellow or red lights. Motorists can’t pass buses or try to get around them. The flashing lights mean the bus is either picking up a child or dropping one off. Drivers should keep a safe distance away and stay alert for any children crossing the road.